There are a number of online slots available based on different sports and within that genre there are a good few based on the world’s favourite – football (or soccer of you’d prefer). Football Fans from Playtech is a colourful and fun slot with a some nice bonus features and a clever touch which allows you to customise the colours to your country’s preference. although those who aren’t from England, Germany, Brazil, Argentina, Italy, France or Spain will have to choose their allegiance. 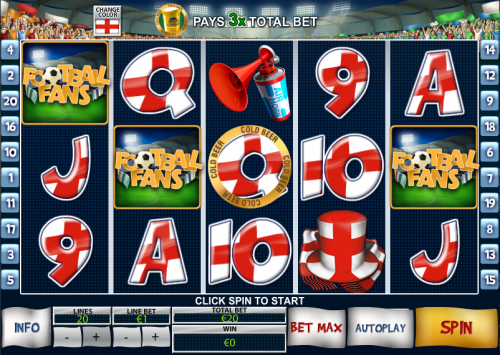 Football Fans features five reels and twenty paylines and Playtech’s standard playing card symbols for the lower values. Higher value symbols are represented by an air horn, a scarf/top hat combo, two scantily clad ladies, a bunch of football fans and a cold beer. There’s a flaming football wild symbol and the scatter is the Football Fans logo. When you first start playing the game you will notice a gold ring labelled ‘cold beer’ on the reels; before each spin you can shift this ring to any reel position you like. If the Cold Beer symbols lands on that position you’ll win three times your total bet. You can move it again if you like but if you don’t it will always remain in the last place you left it. 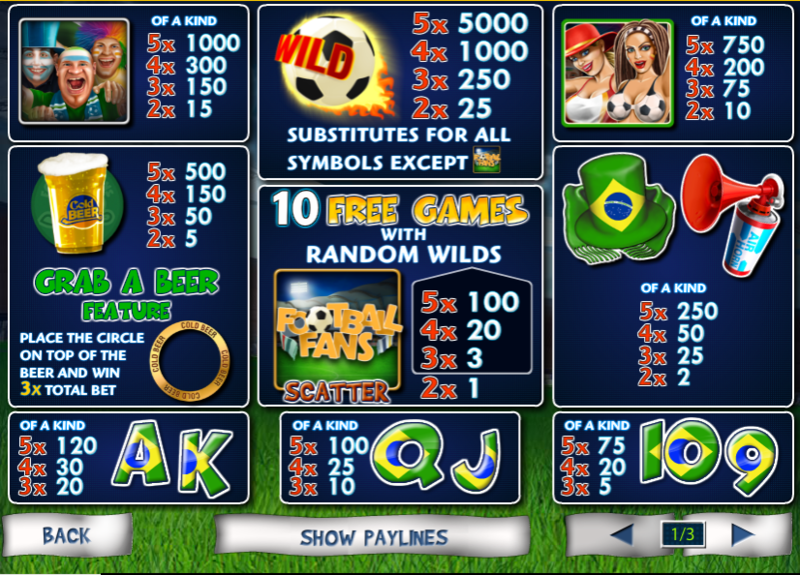 This is the main bonus game and to trigger it you’ll need to land three of the Football Fans scatter symbols any where on the reels. You’ll be awarded fifteen free spins and after each spin, between one and three footballs will be booted towards the reels; each one turning into a wild. During this bonus phase, it’s possible to win ten more free spins infinitely by landing three more scatter symbols. Check the video below to see the bonus game in action. We like Football Fans – it’s a colourful and entertaining slot with some nice graphics and a decent bonus game; the ability to change team colours is also a nice feature. The minimum bet per payline is £0.01 but you can bet up to €500 per spin if that’s your wish.